Something to be said with where you were born. On my Birthday (Nov 7) my wife and I took our only vacation of the season. Away from all the horses and work. We headed to my hometown Dushore PA. We stayed at Ricketts Glen State park in one of their cozy cabins. At Ricketts Glen they have 7.2 miles of trails following 22 named water falls. The best part was the full loop of trail system in PA Blue stone. You don't have reach far to grab any stone to build what you need. Hard to believe this is my hometown! More stone then I could ever dream of. Fate? Childhood memory imprints? I took more then one photo as you could only imagine it was a stone candy store. unfortunately I had a computer glitch and lost all but one. One from a old rail road bed of the Loyal sock trail. 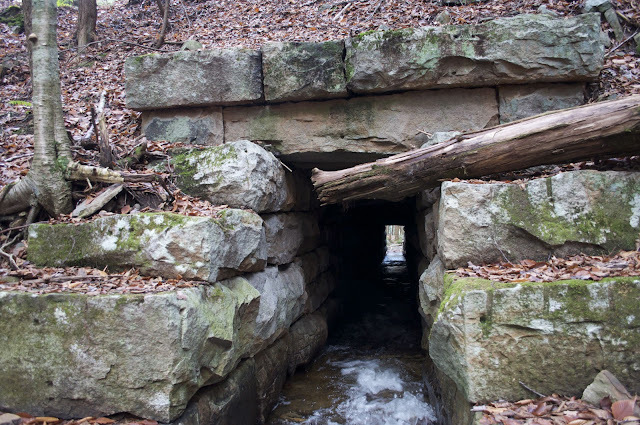 A stone linteled drain which still works to help filter the mountain water from one side to the other. A true work of craft just like all the trail systems. Probably overlooked by those who walk over them everyday. Unless you love stone like I do. Water falls,? .... honey why didn't we bring the pick up truck to load some of this up???? I'll be right back in 4 hours. Wait right here - don't let anyone touch that stone. This was built for the rail system and logging between the years of 1902-1925. You can see the beauty of all the wedges and shims on most of the stones. Once large boulders now made into large beautiful building blocks.